After a sitting Muslim parliamentarian’s bid to contest the November polls was blocked based on the veracity of his citizenship, the leader of a Buddhist hyper-nationalist group slammed the ruling party for ever letting him into parliament. U Wirathu also suggested further restricting seats to “national ethnic” candidates to prevent clever foreigners from tricking “dim-witted” voters and overrunning the government. “In our country, non-national citizens who are descendents of foreigners are allowed to be elected whenever they become citizens of Myanmar. That fact is dangerous,” said U Wirathu, of the Committee for the Protection of Nationality and Religion, which is better known by its Myanmar-language acronym Ma Ba Tha. “Our national people are dim-witted. When the descendants of foreigners who are sharp-witted enter the hluttaw they will push through laws that benefit the interests of their people. That’s why I want to urge voters to elect only national ethnic candidates,” he said, adding that the law should be amended to allow only “national ethnics” into public office. Under the current Pyithu Hluttaw Election Law, candidates must be at least 25 years old, have lived in Myanmar continuously for 10 years, and be a citizen born to parents who are also both citizens. At least three candidates registered for the November 8 election have so far been disqualified by the Union Election Commission on the grounds that their parents were not citizens at the time of their birth. Sitting Pyithu Hluttaw MP U Shwe Maung, also known as Abdul Razek, was informed on August 22 that he was cut from the candidate list after state immigration police verified a citizenship complaint filed by his ethnic Rakhine political rival. U Shwe Maung, who maintains that both his parents were full citizens at the time of his birth, was confirmed by the UEC and elected to represent Buthidaung in Rakhine State as a member of the Union Solidarity and Development Party in 2010. In a bid to defeat its ethnic Rakhine opponents, the USDP adopted the controversial strategy of courting the Rohingya community in 2010. U Wirathu said in its effort to win seats the USDP had “allowed everything outside law and were not in accordance with election rules”. 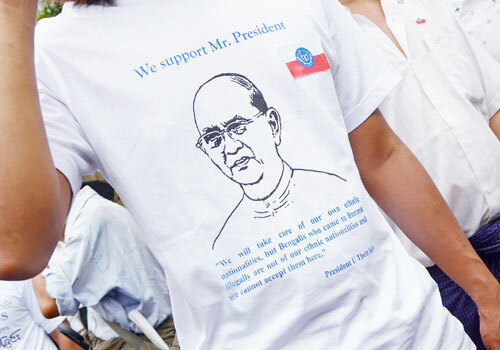 “At that time, Rakhine people objected and complained, but the party didn’t care,” he said. The USDP’s overture to the Rohingya appeared to backfire, however, as the Rakhine Nationalities Development Party – which later became the Rakhine National Party – swept the state. Sectarian tensions between the Rakhine and Rohingya communities came to a head during deadly riots in 2012. During a subsequent outbreak of violence, U Shwe Muang was accused of defamation for suggesting police were involved in arson. As the USDP lined up its candidates for the November 8 vote, none of the party’s three Muslim Pyidaungsu Hluttaw MPs, who all represent voters in northern Rakhine State, were accepted to re-contest their seats. Only U Shwe Maung filed to run, as an independent. Both he and another independent Muslim candidate contesting Rakhine State have been disqualified by the commission. In 2010, many Rohingya who voted held temporary ID documents known as white cards. This was deeply controversial, as white cards are issued to those whose citizenship status is unclear, while the constitution states that only citizens can vote. In February of this year, parliament enacted a referendum law that would enable those holding white cards to vote, a decision that prompted public protests. The government responded by cancelling white cards, while theConstitutional Tribunal ruled that white-card holders were not allowed to vote. As a result, hundreds of thousands of those who voted in 2010 have now been stripped of the right to do so. The New York Times reported on August 23 that up to 500,000 had been taken off the rolls as of June. Now their representatives have also been barred, prompting some rights groups to question how much of a democratic milestone the looming elections will be. “It could mean that Rohingya-majority consituencies in northern Rakhine State are won by candidates who want to see them expelled from the country, permanently interred or worse,” said Hanna Hindstrom from the Minority Rights Group. The Carter Center, a US-based not-for-profit that has been invited to monitor the election, warned that the exclusion of Rohingya voters and the growing anti-Muslim rhetoric threatens the integrity of the coming poll. But Rakhine State’s Muslim minority is not the only group targeted by the election commission for alleged foreign roots. A physician and opposition National League for Democracy candidate in Mandalay’s Chan Aye Thar San township, Dr Win Myint, has also been told he is ineligible to run for election. The sub-commission office refused the NLD candidate allegedly because his father is ethnically Chinese and not a full citizen, a claim he refutes. Both U Shwe Maung and Dr Win Myint say they and their parents were citizens long before the electoral law was enacted, and before the 1982 Citizenship Law created categories of citizenship. Both plan to contest their disqualification. As the election commission continues scrutinising the 6000 candidates through the end of this month, Ma Ba Tha has encouraged stringent checks and the disqualification of “non-nationals”.